James Ruse Reserve is located on the corner of two extremely busy roads (Harris and Hassal streets on the Parramatta/Harris Park border) and yet, when you’re there you wouldn’t know it. The children’s playground and water play area are set far enough back from both roads that the traffic barely registers. This is a great thing because the park is a terrific place for children and as we all know, having to maintain constant vigilance where roads and traffic is concerned can really detract from an otherwise fantastic and fun filled activity! The water park hasn’t been open long (since 2014) and still has that ‘new’ feel to it, but is already a clear favourite with local families. We visited in the evening on a very hot day and the park was filled to the brim with other families doing exactly as we were- burning off a little bit of that crazy pre-bedtime energy and escaping the heat. Despite being very busy, I never got the sense that it was too crowded and I could keep an easy eye on my two children without them disappearing amongst the crowd. The other children were all very well behaved and while they were all clearly having a ball, everyone was acting very responsibly and safely which added to my sense of comfort. Water parks can be slightly hazardous for toddlers who are still a little bit unsteady on their feet and for smaller children who can easily be bowled over by larger children running. But there was none of that to be found here. In fact, it was extremely calm and dare I say it, rather tranquil! 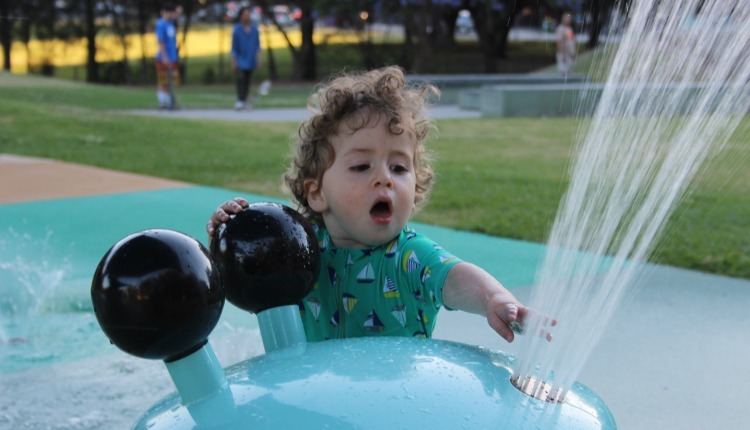 This water park shares many of its features with others in the area with tipping buckets and larger cascading water features for the older children and mini fountains for the little ones. The water tends to pool somewhat in this playground unlike others where used water drains away completely and quickly but children were taking advantage of this feature by sitting and wading in the shallows. 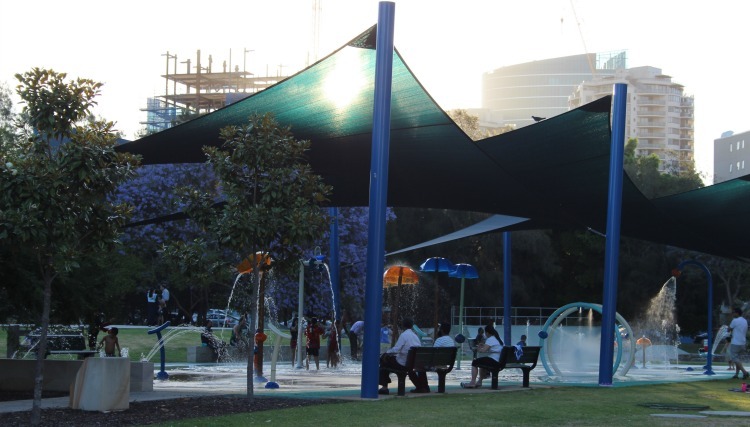 The water park is entirely shaded by sailcloth which makes it a safe venue for summer daytime play although I would still recommend bringing the sunscreen and hats since there is a strong likelihood your little ones will want to check out the fun adjacent playground in between splashes! The water is switched on from 9am to 8pm each day between September and May which allows visitors to take advantage of long summer days. Parking is limited and metered but when we visited at a little after 6pm, we were able to park for free and didn’t have any trouble getting a park. It would also be entirely possible to walk from Parramatta station to the park if you wished to use public transport. Unfortunately, the bathroom facilities were a fair walk from the playground (right across the adjoining oval) which can be extremely inconvenient with small children, especially when they’ve been engaged in water play! 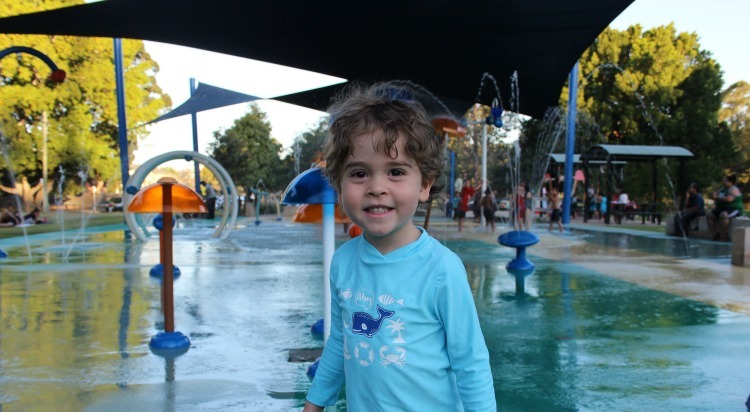 It is quite extraordinary the number of playgrounds in Sydney that have omitted this facility and it makes you even more grateful when you find a great park with great accessible public amenities. 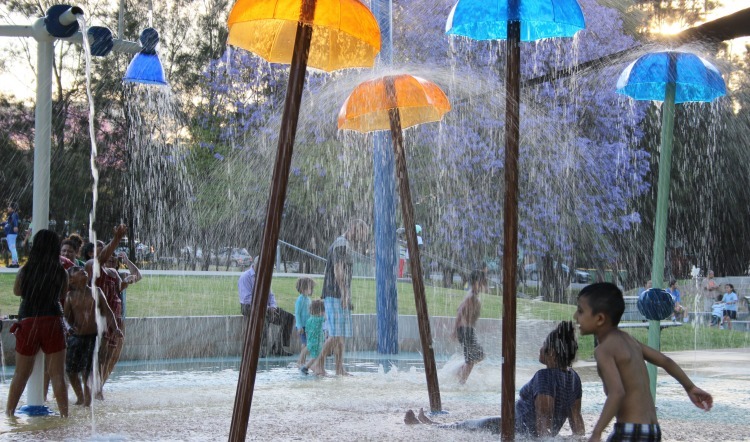 Nor does the reserve have any cafe but it does have picnic facilities and the vibrant cafes and restaurants of Parramatta and Harris Park are just a stones throw away. My children had a great time at this park and we will certainly be returning on many occasions throughout the summer. See you there!